Every February, four dozen athletes are invited to Alaska to undertake a journey which will challenge their bodies and minds, their wills to succeed, and their wills to live. The Iditarod Trail Invitational is the world's longest, toughest and most remote ultra marathon, challenging competitors to journey 1000 miles across the Alaskan tundra on bike, foot, or ski. 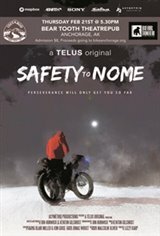 More people summit Everest in an afternoon than have made it from Anchorage to Nome on a bicycle. But this year twenty-six racers will attempt the full 1000 miles of the Iditarod Trail.